“The Cliffs of Green River, Wyoming”, by Thomas Moran. 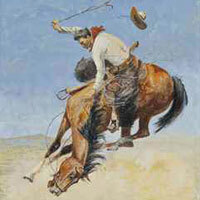 A collection of 68 paintings depicting the American West have fetched more than $US17 million at auction in New York. The works were offered on Thursday by auction house Christie’s at its Rockefeller Plaza base. The top price paid was $US8,565,000 for an 1896 Thomas Moran painting, The Cliffs of Green River, Wyoming. It carried a pre-auction estimate of $US6m to $US8m. Another similarly themed Moran painting, Cliffs of Green River, Wyoming Territory, fetched $US1,925,000. Both works featured horses. The paintings at the auction were part of the collection of American businessman, sailor and collector Bill Koch. The works spanned the 19th century to the present day. “Cliffs of Green River, Wyoming Territory”, By Thomas Moran. Christie’s said the offered works sold for a total of $US17,189,125, including the buyer’s premium. The offerings included paintings by Moran, Frederic Remington, Henry F. Farny, William Robinson Leigh, and Philip R. Goodwin, among others. The sale also featured notable examples by many of the most important contemporary Western artists, including Howard Terpning, Martin Grelle, Tom Lovell and G. Harvey. Remington’s work, Pretty Mother of the Night – White Otter is No Longer a Boy, sold for $US2,345,000. A Frank Tenney Johnson painting, The Sutter Creek Stage, fetched $US365,000, while Edward Borein’s Swappin’ Ends went for $US100,000. Koch said before the auction: “Many works were purchased and intended for installation in my western town, but I am now just simply out of room! Frederic Remington’s “Pretty Mother of the Night – White Otter is No Longer a Boy”.